Mariners Row is the traditional retail shopping street or Main Street in City Center. This private street provides access and diagonal parking to the retail customers and is highlighted with decorative lighting, extensive plantings, brick sidewalks, a performance stage area and a fountain/sitting area. Designed so that during performance events, the street can be closed to vehicular traffic, it becomes a wonderful festival area for pedestrian activities. With retail buildings built into and under the adjacent Fountain Way Parking Garage, the parking and retail street become an integral element providing over 700 parking spaces, while architecturally hidden from the retail street. 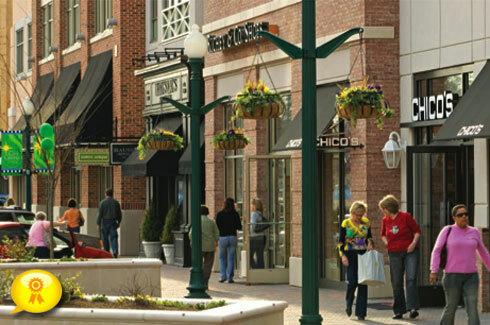 Mariners Row Retail Street was voted First Honor Award in 2007 for its innovation, pedestrian friendly scale, and amenity to the retail district by the HRACRE. An integrated vehicular and pedestrian signage program was developed that focused on gateway, district, parking structure, building, and kiosk signage. The intent was to convey the necessary messages in a consistent, quality fashion that supported the City Center brand entity. The signage system compliments the mixed us development in both scale and sculptural amenities. The graphic system was awarded a Third Place in the Electric Sign Systems Category in the Signs of the Times 2007 International Sign Contest attesting to its imaginative solution to providing information in the urban setting.